Waterloo is quickly becoming one of North America’s hotspots for applied artificial intelligence. Our recent survey found that our community now boasts 95+ AI businesses, from global giants like Google and SAP to startups launching products that bring artificial intelligence to advanced manufacturing, automotive technology, robotics, security and more. 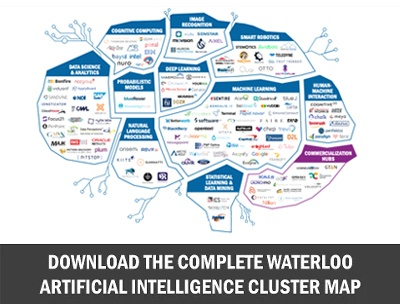 Situated in one of the most AI-research-intensive regions in North America, Waterloo is home to one of the western hemisphere’s top AI universities, a world-renowned technology ecosystem, incredible cost advantages and research assets, and a fast-growing pool of top talent. There’s a lot happening in this map, so let’s break it down. As you might expect, categorizing companies across an entire ecosystem – offering an incredible range of products and services – isn’t easy. Most businesses fit in multiple categories, and defining the categories themselves is a challenge. We asked each business to choose one category where their product or service fit best, knowing that most companies could easily fit in several categories. Data Science and Analytics – Companies in this category are focused on the cleaning, preparation and analysis of big data, and include learning software giant D2L. Cognitive Computing – These are companies focused on hardware or software that mimics the functioning of the human brain with the intent of helping to improve human decision-making. In Waterloo, one example is Thomson Reuters, which has an innovation outpost at the Communitech Hub. Image Recognition – Companies in this category are developing software that can identify objects, places, people, writing and actions in images. One example from Waterloo is Miovision, which has developed innovative traffic monitoring systems that are used around the world. Smart Robotics – These are companies developing artificial intelligence systems that can learn from their environment and experiences, allowing them to build upon their initial capabilities. One example is Deep Trekker, which develops robots for underwater exploration. Deep Learning – Companies in this category work in a subset of machine learning where artificial neural networks, algorithms inspired by the human brain, learn from large amounts of data. One example from the Waterloo ecosystem is Darwin.AI, which has developed a platform to make the creation of new AI models more efficient. Probabilistic Models – Companies in this category strive to represent and manipulate uncertainty about models in order to make better predictions. One Waterloo example is BlueRover, which uses sensors to collect data on any type of transportation, workplace or building and find efficiencies through predictive analytics. Natural Language Processing – These companies are focused on programming computers to process and analyze large amounts of natural language data. One example is Kiite, which uses AI to support sales teams, addressing needs like onboarding, sales enablement and sales management. Machine Learning – These are companies that study the algorithms and statistical models that computer systems use to progressively improve their performance on a specific task. There are many Waterloo examples of companies working in machine learning, including Google, OpenText, Blackberry and more. Human-Machine Interaction – Companies focused on the design and use of technologies that let humans interact with computers in novel ways, including North, a company that recently launched augmented reality glasses called Focals. Statistical Learning & Data Mining – These companies – including Skywatch and Intel – develop predictive functions based on large data sets. We also thought it’d be helpful to list research labs and commercialization hubs that help AI companies – and those companies looking to incorporate AI into their current processes – innovate. Our list of research labs includes the University of Waterloo’s Artificial Intelligence Institute, Conestoga College’s Centre for Smart Manufacturing and Digital Innovation, and much more. Commercialization hubs include the world-renowned Communitech hub, the world’s largest Internet-of-Things manufacturing space – Catalyst137 – and the Accelerator Centre, which is one of the world’s top university-linked business incubators. Think you’d like to see the whole ecosystem? Are you exploring the possibility of locating, relocating or expanding your technology business?